Originally published in Spanish. Manuel Alejandro Hidalgo Pérez and Jorge Díaz Lanchas. Agenda Pública. The disdain towards other collectives seems to be a common strategy while pursuing some other political goal, even if those other collectives are fellow citizens. Apparently, Spain has not been spared from this attitude. The secessionist movement, legitimate or not –we won’t enter that discussion- has organized for decades its discourse around the economy, stating the Catalan good work as opposed to the disregard for labor and laziness that could seem to be abundant in other Spanish regions. In this piece we argue that there are some statements regularly used by the secessionist movement that could be easily called into question or at least be criticized. “They are robbing us” has been a recurrent slogan for years, shaping into the popular belief some ideas either representing prejudices against other regions or even not based on actual facts. On the contrary, looking at hard data there is no trace that the evolution of Catalonia was economically hindered during the democratic period. There is no perception of a negative bias just for being Catalonia. Neither its contribution to the public treasury seems to exhibit any discriminatory behavior. Maybe even the other way round. A large proportion of the prosperity of this region comes from its huge integration with the rest of the country and from the fact that it has made good use of its geographical advantages and the availability of economic factors, in particular education, which is quite superior to that in other regions. In fact, if Catalonia has become a major contributor region to the public treasury is due to the mechanisms created by the Welfare State for citizens and not for lands. 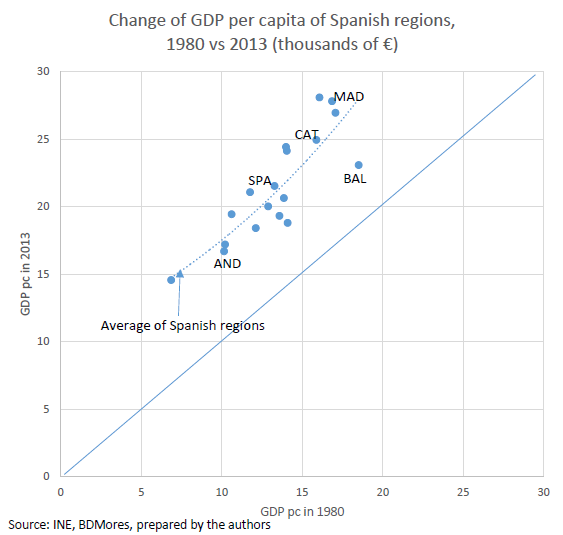 Considering the long-term evolution of the Catalan economy, there is no evident detriment when compared with the pattern of the rest of the Spanish regions. 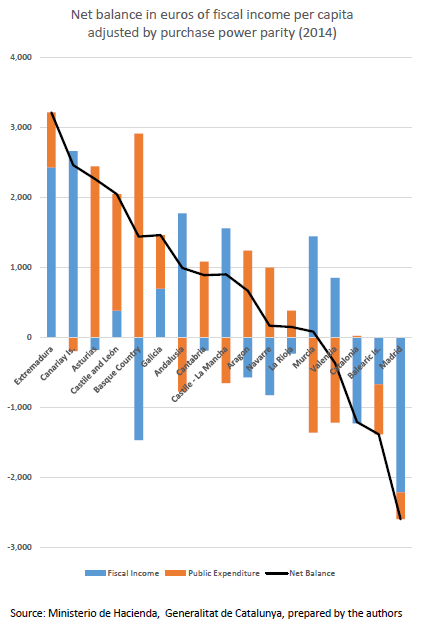 The following chart reflects the evolution of the GDP per capita (in constant prices) of the 17 autonomous communities between 1980 (horizontal axis) and 2013 (vertical axis). Each of the points represents a region, and the fact that all are above the diagonal means that all the regions, without exception, have increased their per capita income during the last almost four decades. For Catalonia this growth has been similar to that of the rest of Spain (dotted line that crosses the point cloud). Therefore it can be stated that we don’t see any differential growth for Catalonia, whereas we do see a diminished growth in striking cases such as the Balearic Islands. The similar growth rate of the Catalan GDP per capita and the Spanish average means that Catalonia maintains its relative difference since 1980. The following figure presents this difference between the Catalan and Spanish GDP per capita, but extended to 1964. 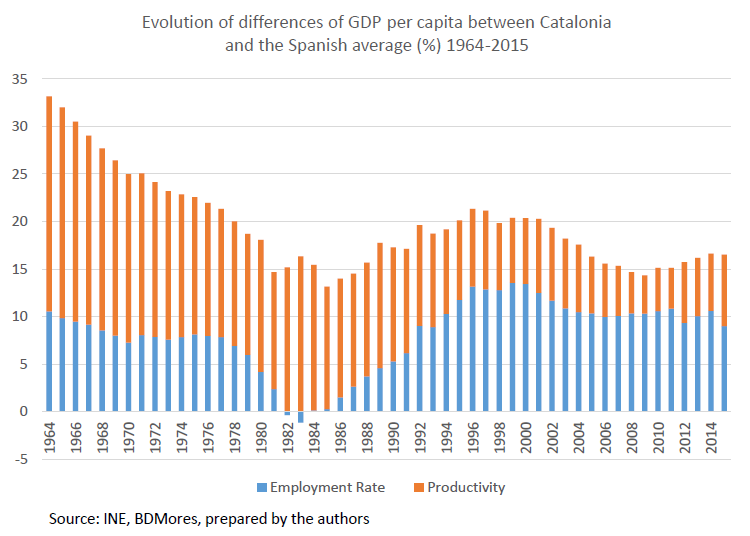 For instance, in 1980 the Catalan GDP per capita was 18% higher than the Spanish average, while in 2015 it was 16.5% higher, that is, a difference of just one and a half percentage points. The higher level of Catalan income per capita could be explained by two factors: First, that the Catalan workers were more productive (they generated more value per worker), so they were more effective. Or second, that there were more workers per inhabitant (employment rate), which would depend not only on the labor market but also on the demographic structure. It’s also possible that both happen at once. From the difference of 18% in 1980, just a little more than 4% was explained by a higher employment rate, whereas the biggest contribution, the remaining 14% was caused by its higher productivity. In 2015, more than half of the difference with respect to Spain, 9 out of the 16.5%, were explained by a higher employment rate (less unemployment or different demographic structure), whereas 7.5 was explained by differences in productivity. This chart means that the evolution of the Catalan labor market allowed it to keep the difference with respect to the rest of Spain during these decades compensating the dwindling differences in productivity. In other words, we see that in the last decades the lower differences between Catalonia and the other autonomous communities would be explained in a large proportion by a regional convergence on this variable that lasted at least until the Great Recession. In this way, we can say that Catalonia is still today, as it was in 1980, one of the richest regions and with a growth pattern similar to that of Spain although maintaining the relative distance with it. The better position of Catalonia is caused in a large proportion by the abundance of productive factors (human, corporate and even institutional capital), and also due its sectorial specialization. In addition, its geographic location grants Catalonia a commercial character. In fact, throughout the decades it has established itself as a main trade hub between Spain and Europe and the rest of the world. 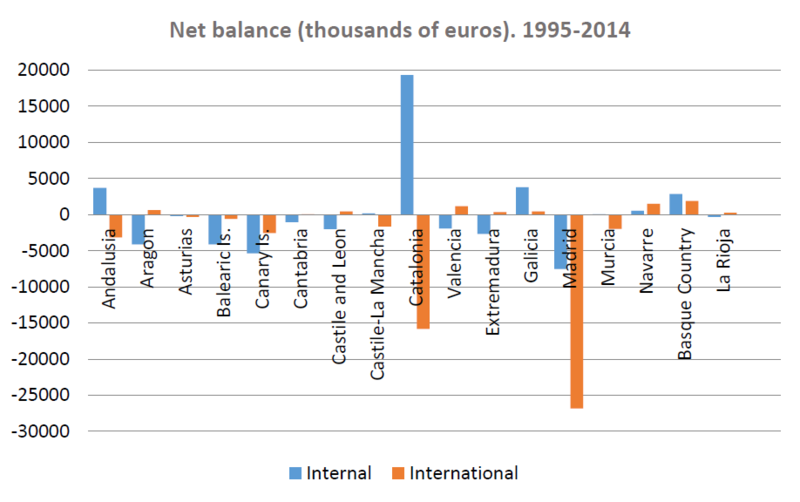 The next figure shows the average between 1995 and 2014 of the (net) balance of trade of all the autonomous communities when they trade with the rest of the world and when they do with other Spanish regions. As can be seen, Catalonia has two completely opposed balances. While it keeps a deficit in its exchanges with the rest of the world, it has an even bigger surplus in its trade with the rest of Spain. That is, Catalonia is able to finance its exterior deficit by being tightly integrated commercially with the rest of the regions. Otherwise, it should be expected a severe internal economic adjustment to correct its strong exterior imbalance. This commercial surplus with the rest of Spain would explain its better economic position, which implies that Catalonia is a net contributor in the framework of fiscal redistribution set by the Welfare State. The fiscal income for the state is higher than the expenditure done in Catalonia, but that is not an exceptional situation. In the next chart the Spanish regions are represented as a function of its fiscal balance per capita in 2014 (the last available data, and adjusted by purchase power parity). It can be seen that Catalonia, together with Balearic Islands and Madrid, are the maximum net contributors to the rest of Spain. On the contrary, Extremadura, Canary Islands and Asturias are the regions that receive more. Regarding the origins of the fiscal deficit, it is not caused by the expenditure as much as by the income due to its high income per capita. In order to understand the importance of the income from Catalonia for the public treasury, the chart on the left in the next figure represents in the horizontal axis the deciles of income of Spanish families. The first decile corresponds to the poorest 10% families in Spain, the second those families between 10% and 20%. Finally, the last one contains the 10% richest families. Once families have been classified by income level using data from the “Encuesta de Condiciones de Vida” (Living Conditions Survey) from INE for years 2009 to 2015, we calculated the net taxes paid by them as a function of their region of residence. Only three regions are represented, Catalonia, Madrid and Andalusia for the sake of simplifying the exposition. The negative figures for low deciles mean that those families receive in public monetary transfers more than what they pay in taxes, whereas the positive values mean the opposite. This chart shows something evident: Taxes are paid by citizens, and expenditures are also received by them. It can be verified that the net payments of families from Madrid and Catalonia match perfectly according to their income level. 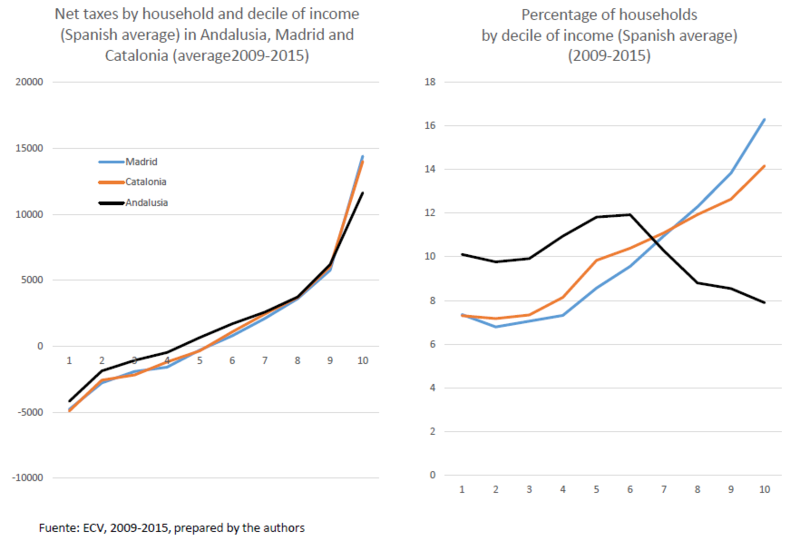 Madrid and Catalonia pay more than Andalusia in aggregated terms (region) only because the distribution of incomes in the families in these regions is biased towards higher incomes (chart on the right). That’s the reason why Andalusia is a net receptor. That is, a large proportion of the fiscal balances is generated by the distribution of incomes inside each region. After all, it is people and not the regions who pay taxes. The information is extensive and we could go on, but considering what has already been presented, we believe it is not pertinent to set up a full blown political campaign on the grounds of claims that we do not consider to be correct and that if they were, would be very difficult to prove and to communicate to the public without potential misunderstandings. On the contrary we can say that this kind of campaigns show a strong lack of knowledge (intended or not) about the Welfare State and its redistributive role among the Spanish regions. For this reason, if we do want to denounce a robbery, at least we should do it without attacking the Welfare State… and without throwing prejudice against other regions.